Prepare Your Fire Pit and Surrounding Area: If not set right or basic safety procedures aren’t taken, a fun outdoor fire can go from terrific to terrible. Below are some tips for having the safest backyard fire possible. Only build a fire in enclosed, contained areas such as an outdoor chiminea, fire bowl or fire pit. Clear the area around the pit of dry paper, grass, leaves, or pine needles to avoid random sparks from igniting them. Move furniture away from the fire pit to avoid burns from the sparks. Consider adding a fire pit screen to contain sparks — a great option especially if children will be around the fire. Before starting the fire, make sure that the lid will still close to extinguish the fire in case of emergency. Don’t overload it with fuel. Make sure the pit is on a flat surface in an open area — NOT underneath trees or roofs or in a building to avoid anything accidentally catching on fire. Check out the wind direction before lighting the fire. The direction of the wind can affect the strength of the fire — another reason to have a fire pit in an open area. Keep flammable liquids far far away from the fire pit. The heat alone can cause the liquids to catch fire. NEVER leave a fire unattended. Even the smallest fire can grow into a large one without supervision. Keep your distance! Fire pits have a knack of spitting out sparks without warning. 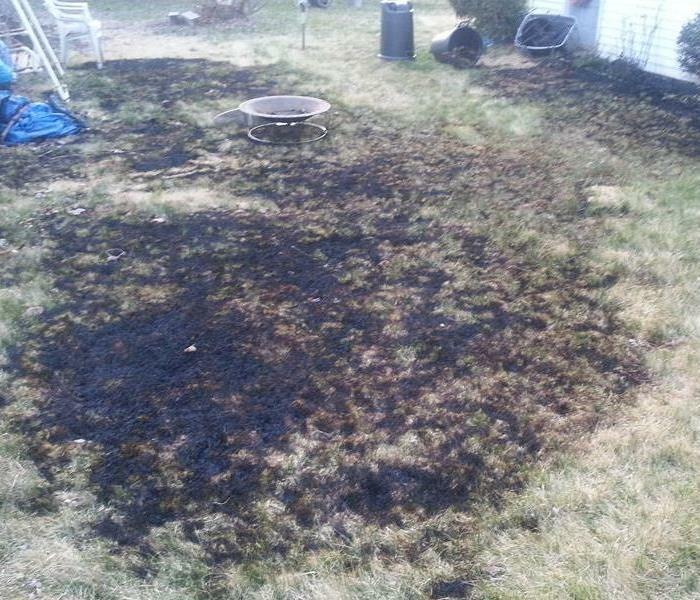 NEVER use garden waste or garbage in a fire. These items produce harmful black smoke into the air. Make sure to use seasoned wood or charcoal. Keep a first-aid kit nearby to treat minor burns. ALWAYS keep a fire extinguisher or hose nearby to quickly put out a fire in case of an emergency. Never leave children unsupervised. They tend to not realize the danger of fire and often get too close to one. For obvious reasons, be careful with the amount of alcohol consumed around a fire. Alcohol is also very flammable when around heat. Make sure the fire is completely put out before leaving it unattended. Never leave a fire to die out on its own. After 24 hours has passed, all left over hot ashes must be thoroughly dampened, cooled and stored in a metal can that is used solely for ash storage. Ashes that are 2 or 3 days old may appear to be safe, but can still retain enough heat to cause an unwanted fire. Do not discard hot ashes in a compost pile, paper bag cardboard box or anything that is combustible. Also, be careful in handling partially burned wood. The wood may still be smoldering and cause a serious burn. Public domain graphic via NOAA/National Weather Service. What is an ice dam? Ice dams form as a result of warm air inside your home leaking into the attic and warming the underside of the roof, causing snow and ice to melt. The melted water will drain along the roof, under the snow, until it reaches the cold overhang. The overhang tends to be at the same temperature (below 32 degrees) as the outdoors, and the melted water will refreeze and form icicles and possibly an ice dam. The draining water hits the ice dam, backs up under the roof shingles, finds cracks and openings in the roofing, and eventually manifests itself as an interior water leak. 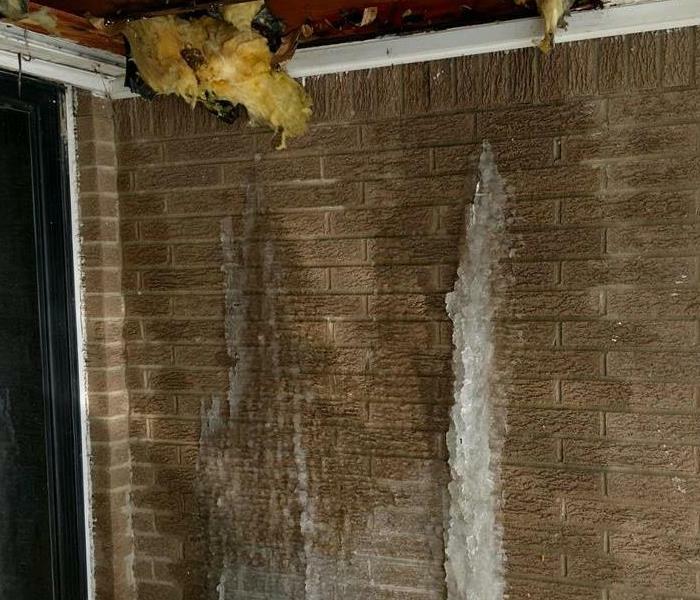 Water damage to your home in Dearborn Heights, caused by ice dams, can be partially prevented by keeping your gutters clean and avoiding any type of exhausts exiting into the attic. 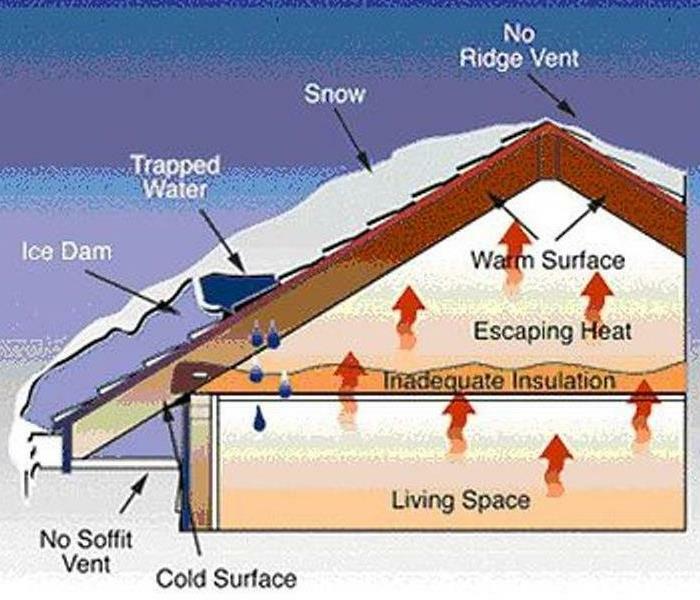 The proper amount of Insulation also plays a key role in maintaining the right temperatures so ice dams are not created. Regardless, even the best, most diligent homeowners are not able to avoid the water damage that can happen as a result of ice dams and they may be in need of professional help. This assistance is where SERVPRO becomes your greatest ally in restoring your home back to its original condition. Being a homeowner, you may be tempted to try your hand at the drying process, but it is best to call in a team of professionals. In addition to drying your attic, ceiling and walls, our SERVPRO team can inspect the structure of your house and determine whether additional repairs are needed. Our specially trained technicians are also able to determine the equipment best suited to navigate the limited space in your attic while achieving the desired results. Our team can work on salvaging insulation if possible, and assuring that those materials that may pose a health hazard for you and your family are properly disposed. One of the benefits of reaching out to a team of experts is the number of techniques at our disposal. Do not be surprised if our SERVPRO technicians decide to drill small holes into your walls as part of the drying process. Containment barriers may be erected to cordon off the affected areas. Our aim is to achieve moisture reduction, which is essential in safeguarding the structural integrity and health of your home. 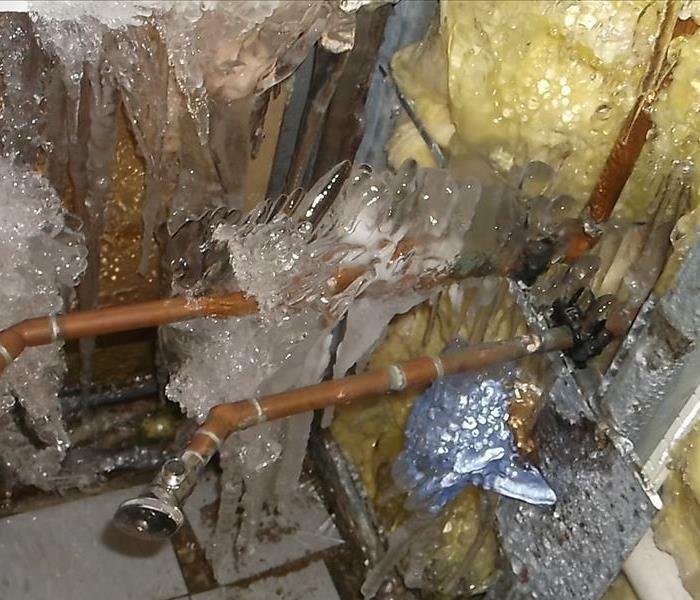 With the recent cold temperatures due to the Polar Vortex, frozen pipes have become a real issue here in the upper Midwest. Water has a unique property in that it expands as it freezes. This expansion puts tremendous pressure on whatever is containing it, including metal or plastic pipes. No matter the strength of a container, expanding water can cause pipes to break. How to Thaw Frozen Pipes: If you turn on a faucet and only a trickle comes out, suspect a frozen pipe. Likely places for frozen pipes include against exterior walls or where your water service enters your home through the foundation. Here are some ways that you can prevent a fire in your home or business. Have Smoke Alarms Installed: Fires often occur at night when you’re asleep and spread so rapidly that some people are overcome by fumes before they even wake up. Smoke alarms will give you early warning and save lives. Have Fire Extinguishers: That’s plural, as in more than one. Many people just have one for the kitchen, but you should have one in every room, especially if you have a fireplace or use space heaters. Don’t forget the garage and attic where people tend to store gas cans, old clothes, and lots of other combustible stuff. Watch the Wiring: Electrical fires account for nearly 24,000 residential fires in the US. In 11% of these fires someone died and in 7% someone was seriously injured. Keep a close eye out for frayed wiring, overloaded electrical sockets are a major cause of fires. If you find that a light switch or receptacle plate feels hot, get it replaced immediately by a professional. Be Careful Cooking: Stay in the kitchen if you’re frying or grilling food. Even a short time out of the room might allow a fire to go unnoticed until it’s too late. Don’t cook with a stove, oven, or grill if you’re sleepy or if you’ve been drinking alcohol. Don’t wear long flowing sleeves when you’re cooking. If you’re cooking with oil, it’s a good idea to have a lid handy for the pan you’re using. A lid will suffocate the fire and give you time to turn the burner off. Don’t try to move the pan or throw water on the burning oil as it will splatter and burn you. Monitor and Maintain Other Appliances: The lint trap in your clothes dryer can cause fires by overheating the appliance. Clean it out after each load. Replace furnace filters diligently and keep clutter several feet away. Let professionals establish and monitor settings and do the needed repairs and maintenance. Portable space heaters are handy, but be certain to remove any combustible clutter at least 3 feet away in every direction. Get a heater that has an automatic shutoff function if it falls over. Teach Your Children: Kids are notoriously curious about fire and flames. Teach them that fire is a tool not a toy. Keep kids 3 feet away from cooking stoves and fireplaces except under your direct supervision. Do not let kids handle matches, lighters, or lighted candles. Kids should not be allowed to use barbeque grills and kids should be taught to follow established escape routes from the home in the event of a fire. Use Sense If You Smoke: Smoking is a fire hazard, so avoid the activity inside the house and, especially, don’t smoke in bed. Avoid smoking when you’re drowsy, on certain meds, or have been drinking alcohol. Make sure that all cigarettes and cigars are completely out before you toss them in the trash. Better yet, have an ashtray with sand in it available. Never smoke in a home in which someone uses oxygen. Oxygen is extremely flammable, even explosive. Come to think about it, isn’t this a great time to quit smoking? Establish Escape Plans: You should be already looking around the house for at least 2 ways to make a rapid exit from the house. If there’s a second floor, the family should know how to easily open the windows and deploy a ladder, in case they can’t get downstairs. Conduct fire drills regularly so that everyone knows exactly what to do in a fire, with a designated meeting spot outside the home. Different types of smoke leave different types of soot residue after a fire. 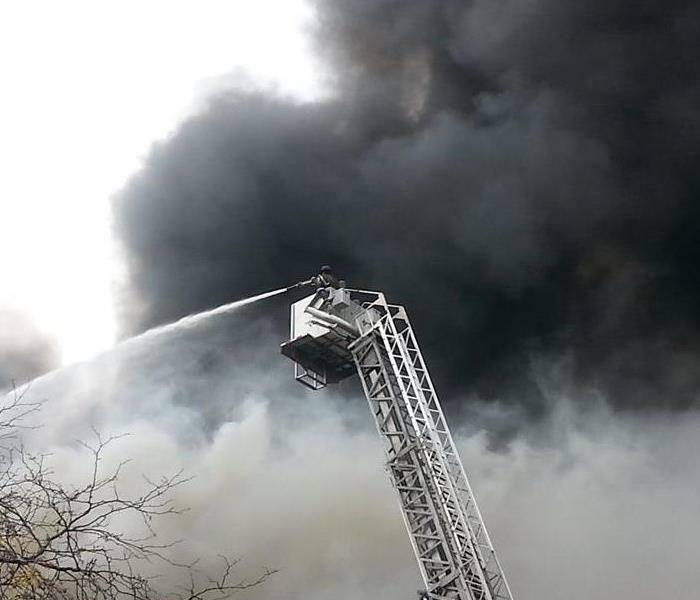 Wet smoke is generated by a low heat, smoldering fire such as burning plastic or rubber. Wet smoke has a pungent odor and is typically sticky and smeary. Smoke webs are more difficult to clean. Paper and wood fires produce a dry smoke. This type of is a fire is fast burning and generates a high temperature. Heat rises therefore the smoke rises and soot residue is usually heavy on ceilings and in attics. A protein fire occurs from the intense burn of a protein-enriched fiber, such as eggs left unattended on a stove, or a forgotten roast in the oven. There may not be any noticeable damage, but there might be a sticky residue coating the surfaces of your home, and an extreme pungent odor. Since each smoke and fire damage situation is a little different, each one requires a unique solution tailored for the specific conditions. Before restoration begins, we will test the soot to determine which type of smoke damage occurred and the cleaning procedures will then be based on the information identified during pretesting. 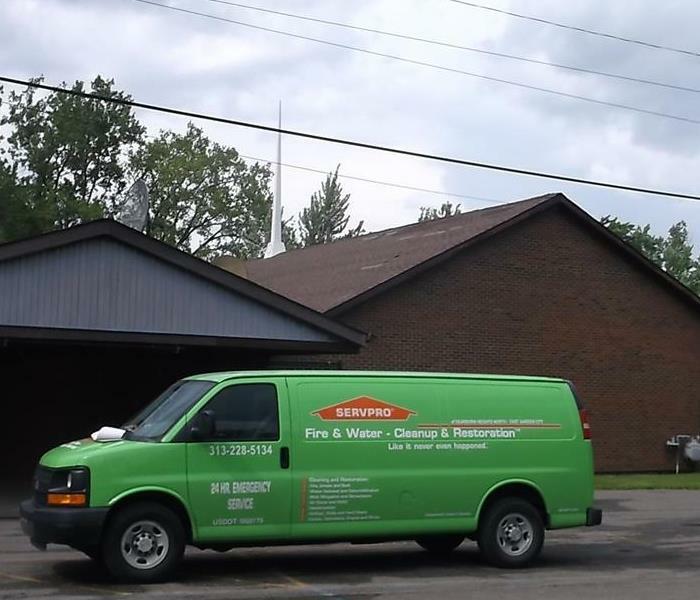 SERVPRO of Dearborn Heights North/East Garden City personnel have the training, equipment, expertise, and experience to restore your fire and smoke damaged property. We will also treat your family with empathy and respect and your property with consideration and care. Fire, smoke, flooding and water damage events at commercial properties are often complex with numerous issues that require a knowledgeable and flexible response. 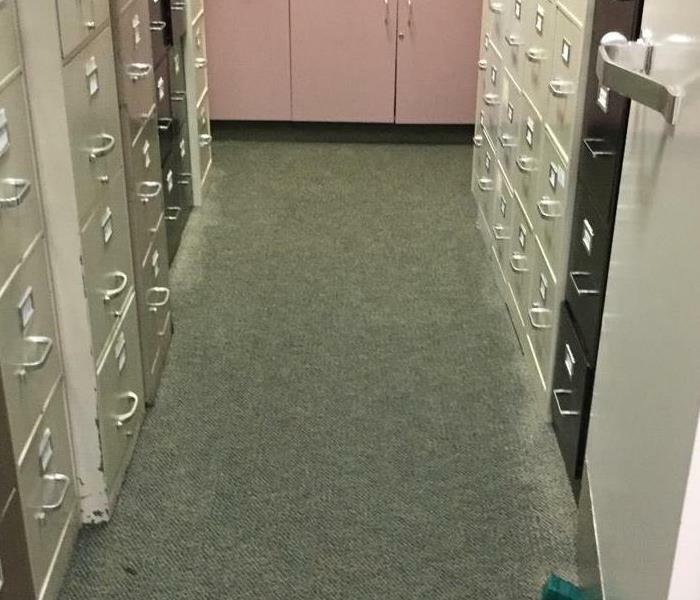 Whether we’re dealing with a relatively small cleanup scenario or a large scale event, SERVPRO works quickly to assess each unique situation, isolate the damaged area and begin cleaning up. In many instances, normal operations can continue in a temporary space while we restore your facility. SERVPRO professionals are trained to be mindful of legal and environmental concerns and strive to fully restore the damaged area while working within your budgetary constraints. We understand that every hour spent cleaning up is an hour of lost revenue and productivity. So when an emergency situation arises in your business, give us a call and we’ll be there fast with the help you need. In times of a disaster, like a broken water supply line or fire and smoke damage, are you equipped to respond quickly and appropriately as a business owner? Creating a plan and familiarizing yourself with certain utility shut off valves for your property can help save you time and money when an accident occurs. For example, knowing how to shut off the main water supply line to the building can minimize the water damage if a pipe were to break. Likewise, knowing how to turn off the sprinkler system can be helpful if that system malfunctions or is broken. Many business owners do not take the time to familiarize themselves with such things and unfortunately end up learning the hard way when something goes awry. SERVPRO of Dearborn Heights North/East Garden City can help all local business owners better prepare for emergencies by creating an Emergency Ready Profile (ERP) for their business. This profile is FREE OF CHARGE and takes about an hour to complete. Our personnel will help you, the business owner, learn how to respond to water, fire, and mold damage situations in your building and how to educate your employees on such situations. The latest industry research indicates that 50% of businesses that suffer a catastrophe never recover. Knowing your risks and how to mitigate your losses can make or break your company after a disaster. As temperatures drop this winter, following are some tips that people can take to stay safe during the cold weather. Make sure your home is well insulated and that you have weather stripping around your doors and window sills to keep warm inside. Have a working carbon monoxide detector. Never use a generator, grill, camp stove or other gasoline, propane, natural gas or charcoal burning device inside a home, garage, basement, crawlspace or any enclosed area. Locate these items a minimum of 20 feet from doors, windows and vents. Keep fire extinguishers on hand and make sure that everyone knows how to use them. House fires pose an additional risk during the winter as more people turn to alternate heating sources (such as space heaters) without taking the necessary safety precautions. If you have a wood burning fireplace, make sure you have your chimney cleaned and inspected. Use a glass or metal fire screen large enough to catch sparks and rolling logs. Make sure fireplace embers are out before leaving the room or going to bed. Run water, even at a trickle, to help prevent your pipes from freezing. Open the kitchen and bathroom cabinet doors to allow warmer air to circulate around the plumbing. Be sure to move any harmful cleaners and household chemicals out of the reach of children. Keep the garage doors closed if there are water lines in the garage. Unfortunately, even the best prepared can still become a victim of water damage due to the cold weather. If this is you, or someone you know, have them call SERVPRO of Dearborn Heights North/East Garden City. Working to make it "Like it never even happened." 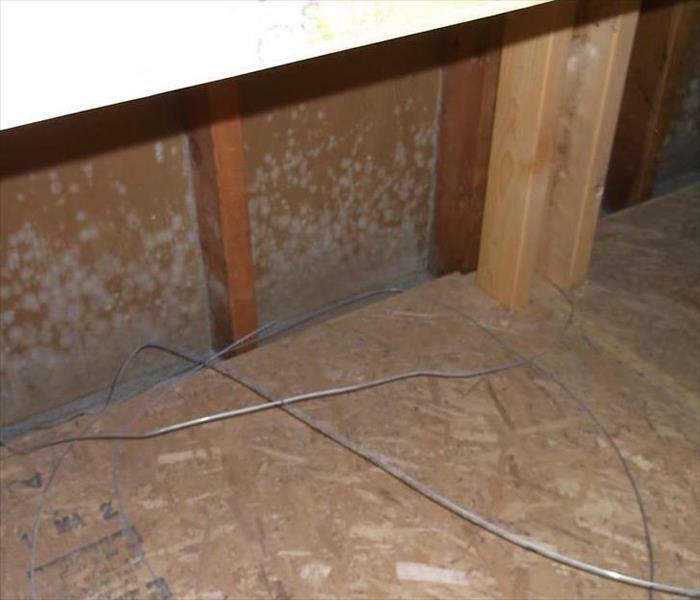 Mold affects more homes and businesses than you think - it’s everywhere. In fact, there’s a pretty good chance that you’re breathing it in as you’re reading this blog. Mold spores are ever present in nature and wet, damp environments are ideal breeding grounds for mold spores to grow and flourish. Left unchecked, the mold will get out of control and an expert mold remediation service company, like SERVPRO, will be needed to get rid of the problem. Mold spores exist almost everywhere, indoors and outdoors. It only becomes a problem when large amounts of spores exist in an area. No one knows how many species of fungi exist but estimates range from tens of thousands to perhaps 300,000 or more. Organic and/or porous materials only have to be exposed to excessive moisture for 24-48 hours before mold can begin to grow. Mold growth usually does not happen directly on glass or concrete. However, it can grow on the dust that accumulates on these materials. Live Christmas trees can be a significant source of mold spores. Humidifiers can cause moldproblems because they could significantly increase indoor humidity making conditions right for mold growth. If you try to paint over porous surfaces, mold will grow through the paint. Things that you can do to minimize the risk of mold contamination include promptly mitigating any water damage that occurs in your home. Drain backups, toilet overflows, leaky pipes and roof leaks, if not properly cleaned, disinfected and dried will create the wet environment that mold spores seek. A dehumidifier placed in an overly humid environment will help reduce the humidity levels which will preclude and minimize the spread of mold. Always Remember to Work Safe! Personal Protective Equipment: Wear protective clothing including safety goggles, gloves, and a dust mask when working with potentially hazardous materials such as glass or spray paint. It is also a good idea to wear a mask when working in a dusty environment. Consider ear plugs or ear muffs if tools are particularly loud. Protect Your Lungs: When painting, or using any material that generates toxic fumes or dust, keep the room well ventilated. Never smoke while painting or standing close to a freshly painted area. Always wear a mask when dealing with fiberglass insulation. Use the Right Tools: Always use the correct tools for the job. It is worth investing in high quality equipment as this will be safer and will probably do the job quicker. Store tools in a safe place, out of the way of children and pets. Keep them in a box or secured on a rack. Knife Safety: When using knives, always cut away from you. Use a baton as a guide and run a sharp knife along the edge of it. Always store knives securely in a safe place. Use Caution When Working with Electricity: When fixing or checking electrical appliances or connections, always switch off the power and remove the fuse or circuit breaker (MCB). If you're fixing an electrical appliance, switch off the appliance at the socket and pull out the plug. As an added precaution, wear rubber-soled shoes when working with electricity and electrical items. 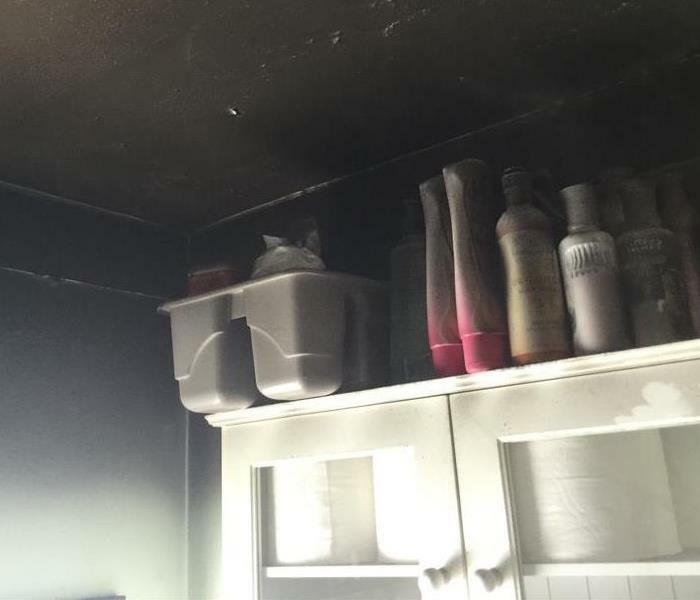 Fire Safety: Always keep a chemical fire extinguisher in the house in a convenient location such as under the kitchen sink, in your utility closet or in your laundry room. Never use water to put out a fire in an electrical appliance. Keep in mind that gas and electrical work is best left to a registered professional. Power Tools: When using a power drill, choose a model that has a plastic non-conducting body. Unplug the drill before fitting parts and remove the chuck key before switching it on. Wear sturdy shoes with slip-proof soles. Avoid wearing loose clothing or jewelry, which could get caught in the drill. Tie back long hair. Make sure that power saws or in good working order and that all guards are in place to ensure safe operation. 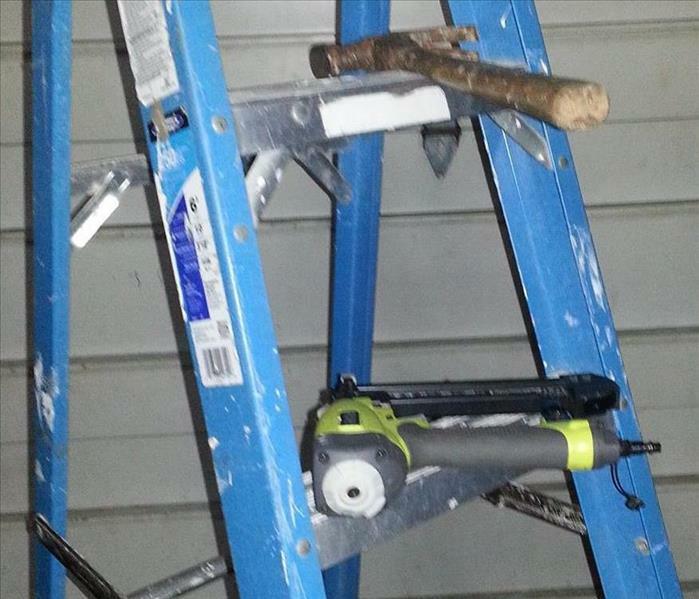 Working with Heights: Ladders are one of the main causes of DIY accidents. Erect the ladder according to the manufacturer's instructions. Never lean to one side as you could lose balance. Take Your Time: Don't rush as you're more likely to have an accident. Carefully plan the job before you start work. Know your limitations and consult a professional if you are unsure. It's also a good idea to ask someone if they can help you.